Major Nickolas Ernest Pope, CD was born 5 April 1942 in Church Crookham, England. He immigrated to Canada in April 1947 and settled in Armstrong, B.C. Major Pope began his military career with the Rocky Mountain Rangers Cadet Corps at Armstrong BC. Following completion of High School, he enrolled in the Canadian Army (Regular) in September 1960 as a Private and was regimentally affiliated with the Queen’s Own Rifles. Following a brief tour with the Second Battalion stationed at Calgary, he was posted to the First Battalion in Germany. In 1963, Major Pope began officer training at the Royal Canadian School of Infantry at Camp Borden, Ontario. 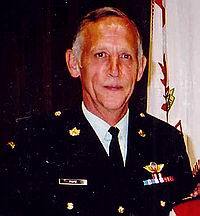 Commissioned as a Second Lieutenant, he undertook a variety of battalion employments in Calgary, Victoria, Combat Arms School, Gagetown NB and three UN peacekeeping operations in Cyprus (1965, 1971 and 1976). Also during this period he participated in many exercises and professional training in Norway, Kingston Staff College, Combat Team Commander’s Course, Management training at St Jean, Quebec and Instructional technique and curriculum design at Camp Borden, Ontario. In 1977 he was posted on staff to Royal Roads Military College. It was during this period of Defence re-organization that he was regiment ally re-assigned to the Princess Patricia’s Canadian Light Infantry (PPCLI). as the Base Operations Officer. On 9 April 1991, he retired from the Regular Force, transferred to the Primary Reserves, again became a Rocky Mountain Ranger and was employed full time at BC District Headquarters, Vancouver for five years in two staff positions I G3 Training for two years; and, G1 (Personnel) for three years. On 31 March 1996, he retired from the Reserves and in June was appointed the Training Officer for the Cadet Corps. Major Pope married to Annette formerly from Toronto, Ontario since January 1967. They had three children, two sons and a daughter. In his youth, Major Pope was a keen mountain climber, cross country skier and a fisherman. After retirement he limited his activities to fly tying and fishing, gardening at home in Armstrong, and assisting the Cadet Corps. He was also a Director on the Board for the Armstrong-Enderby Developmental Association (Kindale) for the Mentally and Physically challenged. Nick died on 6 August 2017 in Chilliwack, British Columbia.